Luxury guide to Bali: where can you find the most exquisite experiences, spas and venues on The Island of the Gods? Read on for the most luxurious places to sightsee, pamper and relax in Bali. A luxury lifestyle is easily attainable in Bali and many visitors come for the upmarket spas, beach clubs and experiences on offer. With world-class villas, restaurants and venues, The Island of the Gods has plenty worth splashing the cash on. Whether you want to cruise around in a private boat, take to the skies with a helicopter ride, or relax in catered-for luxury, Bali has it all! Here are the most luxurious things to do on the island, for a holiday fit for royalty. A luxury lifestyle is easily attainable in Bali. The hustle and bustle of Bali’s mainland can get a little overwhelming at times, especially during the high season. When it all gets too much, take a holiday from your holiday with a luxury day cruise to the tranquil Nusa Islands. Located just a short boat trip from Bali’s southwestern coast, Nusa Lembongan, Penida and Ceningan are typically quiet and peaceful. Many of their bays are often totally deserted, making this the most exclusive beach-outing ever! Private cruises depart from Serangan Harbour in South Bali and offer guests the chance to island hop in perfect luxury. 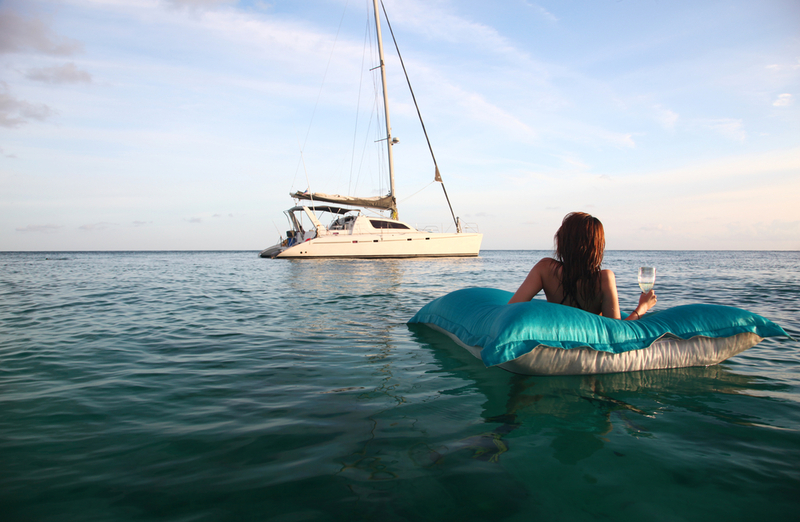 Sip champagne as the waves roll past and enjoy the breathtaking scenery from the comfort of your own private catamaran. Take a luxury catamaran trip to visit the incredible Nusa Islands. When you arrive at the sensational Nusas, your boat will land in private moorings on each of the islands. Here you can snorkel or kayak in crystal-clear, beautifully secluded bays, or soak up some castaway vibes on deserted white sand beaches. 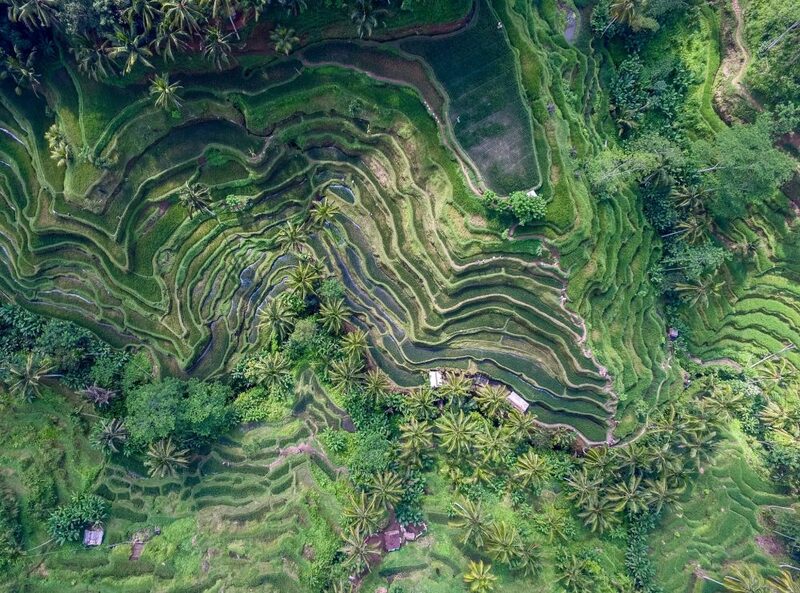 Bali’s diverse and rugged landscape changes dramatically between regions, from the white fringes of its sandy coastline to the craggy peaks of its mountainous midsection. The best way to appreciate this variety in landscapes is from the air. With a private helicopter tour, you can view Balis sweeping rice fields, dense jungle and towering volcanoes from a unique birds-eye perspective. These exclusive helicopter tours run from Denpasar and are a fantastic way to go sightseeing around Bali in ultimate style. Trips can be booked to a variety of exceptional locations, from the pristine southern coastline to the incredible peaks and craters of Mt. Rinjani on Lombok. For a truly unique peek at Indonesia’s outstanding scenery, book your tour well in advance – slots fill up fast! What can be better than admiring Bali? Only admiring it from a helicopter! Bali is famous for high-end accommodation and houses some of the most beautifully designed and insta-worthy villas on the planet. And what better way to spend your downtime in Bali than in your own luxury villa? These blissful havens create the ultimate relaxing sanctuary for you to rest and rejuvenate during your trip. They can also serve as the ultimate venue for entertaining guests and hosting exclusive and intimate parties. But what are the best areas in Bali to rent a luxury villa? Seminyak is well-known as one of Bali’s more upmarket areas and has an abundance of beautiful and stylish villas to choose from. Rent a villa here if you want your luxury trip to Bali to centre around shops, spas, bars and beaches. The beachside town of Canggu is well-known as a surfer hangout and one of the best places in Bali to immerse yourself in the island-life philosophy. Luxury villas in Canggu are often in secluded, peaceful locations, but with excellent access to the town’s beaches and bars – win-win! For a peaceful and relaxing getaway, consider renting a villa is the spiritual town of Ubud. Bali’s cultural heart is surrounded by spectacular rice fields and flourishing jungles and there are many gorgeous villas nestled among the greenery. The coastlines of Bali and neighbouring Lombok are spectacular, with rugged cliffs, flawless white sand beaches and vibrant jungle foliage. See it all in style by hiring a private yacht to serve as your transport and accommodation during your trip. Charter a crewed boat or rent out your vessel on Airbnb, for an exquisite and exclusive tour of the best Bali’s coastline has to offer. Itineraries can vary, but many companies offer packages of a week or more. 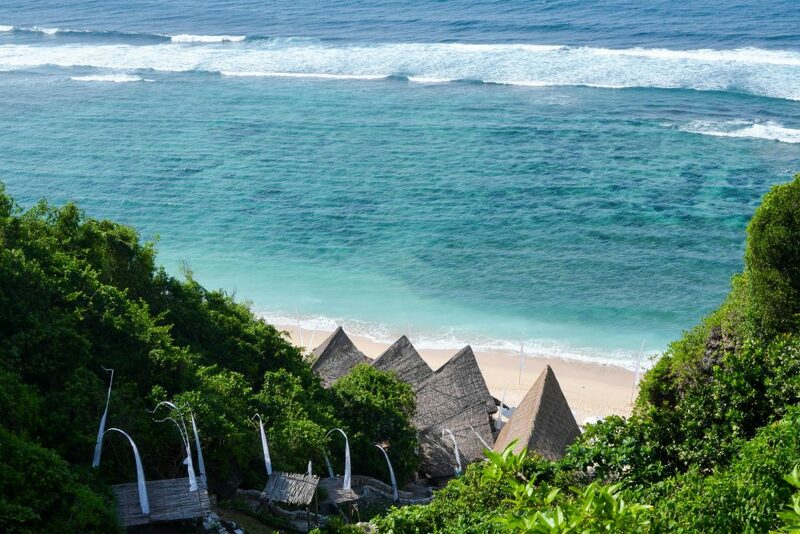 These give you the chance to see several secluded beauty spots around Bali and Lombok at a leisurely, relaxed pace. Snorkel some of Bali’s most vibrant marine habitats and sprawl out on deserted, spotless beaches, for a dream journey you’ll never forget. 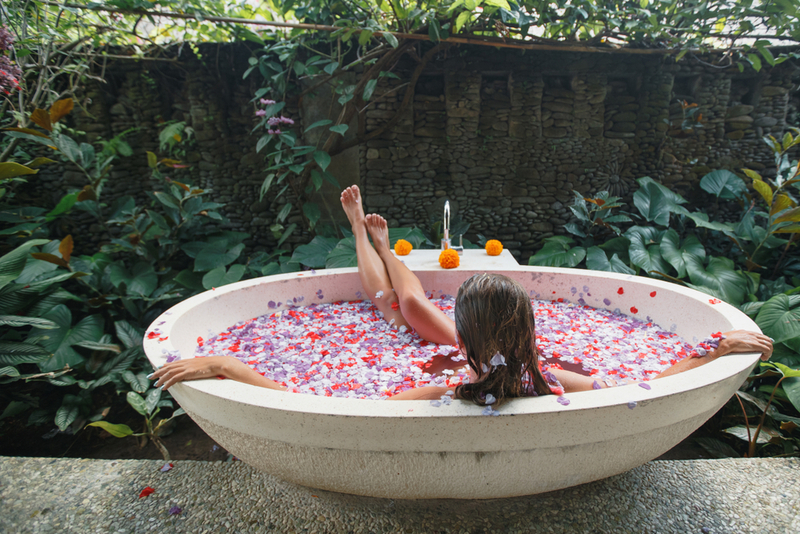 Pleasure-seekers head to Bali for many different reasons, but pampering is pretty high on the agenda for those on a luxury trip. Luckily, Bali caters to this market exceptionally well. The Island of the Gods is home to hundreds of boutique spas and wellness centres, many of which offer luxurious treatment packages. Here are our top picks for the most sumptuous spa experiences to try during your trip to Bali. Luxurious and indulgent spa experiences are to be had all over Bali. The Nest is one of the top-rated luxury spas in Bali and offers a wide range of indulgent treatments from traditional Balinese massages to manicures. Preen and pamper in The Nest’s incomparable beachside setting overlooking the ocean for the ultimate treat on your getaway to Bali. The Hanging Gardens of Bali in Ubud is one of the most stunning locations in Ubud, beautifully designed and nestled amongst lush jungle. Their spa combines restorative traditional treatments with organic, natural products, for a luxurious escape into nature on your trip to Bali. 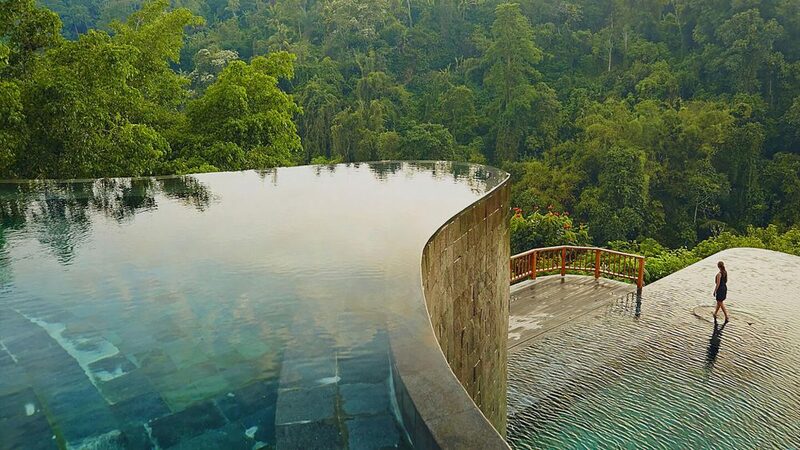 The Hanging Gardens of Bali Spa in Ubud is surrounded by lush greenery. The luxurious Laguna resort is worth visiting for its spa alone. The Lagoon Spa draws inspiration from the seven pillars of wellbeing; life balance, beauty, harmony, vitality, aqua, nature and nutrition. 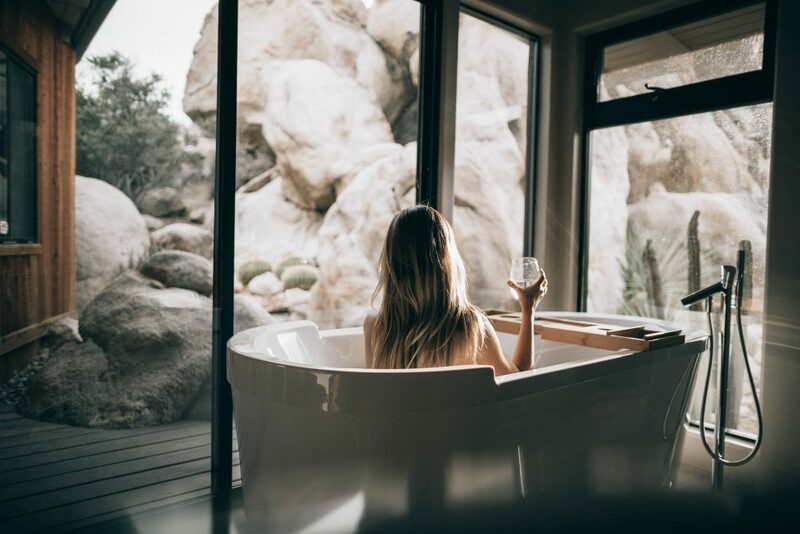 Skilled therapists expertly deliver a range of holistic treatments in the ultimate luxurious surroundings, to replenish and energize your body and mind. Bali’s world-famous beaches are a dream come true, the gorgeous scenery painting the perfect backdrop for relaxation. If the sand-between-your-toes (and in your hair, bags and clothes) thing doesn’t do it for you, can still enjoy the beach in style at one of Bali’s luxurious beach clubs. These exclusive venues can be found all over the island and are well stocked with sun loungers, cocktails and nibbles. But where are the best Beach Clubs in Bali for your luxury holiday? 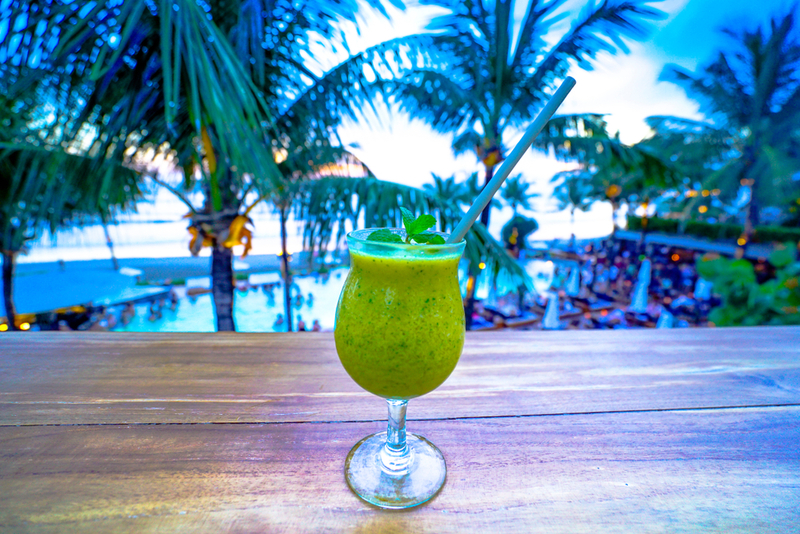 Bali has many luxurious beach clubs to choose from. This uniquely designed, split-level beach club on the coast of Legian is a popular place to eat, relax and sunbathe. This stunning bamboo structure houses a shady, stylish and peaceful setting in which to dine and unwind. Comfortable seating, outdoor sun loungers and a sophisticated ambience make Azul a top pick among pleasure seekers in Bali. Float in their infinity pool while taking in the panoramic ocean views and treat yourself to an array of delicious dishes from their international menu. The Azul Beach Club is an exquisite place to hang out in Bali and is worth at least one visit during your trip. The Potato Head Beach Club’s unique style, premium service and prime beachside location have made this hip hangout a hit in upmarket Seminyak. Located on the very edge of the sand and overlooking the Indian ocean, this is an idyllic setting for a lazy day in Bali. Show up early to secure a cabana, where you can luxuriate in total comfort with a cocktail in hand. Their on-site restaurants serve sumptuous dishes from international menus and all are prepared using the freshest of locally sourced ingredients. Stay for dinner to enjoy the incredible sunset views over the ocean and enjoy an unforgettable evening in Bali. Perched on the beachside of Bali’s Bukit Peninsula is the luxurious Sundays Beach Club. Arrive early for the best spot on the pristine beach and while away your day in perfectly catered-for bliss. Sundays menu is expertly crafted and executed by their critically acclaimed chef and features various Western, Asian and seafood dishes. After lunch, order a cocktail from their drinks menu and chill in the shade to admire the crystal clear lagoon. If sunbathing isn’t your thing, take a kayak or paddleboard around the cool, calm waters of the bay and reef. Make sure you stick around for sunset, when Sundays light up their beach bonfire, creating a cosy, magical atmosphere.